A majority of Americans say it is “unacceptable” for homeowners to stop making their mortgage payments and abandon their homes, according to a Pew Research Center survey. 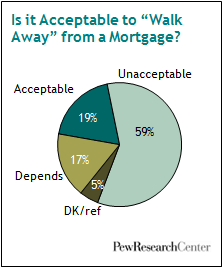 But more than a third (36%) say the practice of “walking away” from a home mortgage is acceptable, at least under certain circumstances. Nearly six-in-ten (59%) believe it is wrong for homeowners to deliberately stop paying their mortgages and surrender their homes to the mortgage lender, according to the survey of 2,967 adults conducted May 11-31. As the housing market continues to flounder in many parts of the country, more than one-in-five homeowners (21%) say they owe more on their mortgages than their home is worth, the survey finds. Some homeowners in this situation stop making their mortgage payments and let the bank foreclose on their homes. In July alone, lending institutions foreclosed on an estimated 93,000 properties, according to data compiled by RealtyTrac Inc.; this was the second-highest monthly total since the firm began tracking foreclosures in April 2005. Not surprisingly, how people fared financially during the Great Recession is linked to their views on walking away from a mortgage. Nearly half (48%) of all homeowners say the value of their home declined during the recession, and as a group they are more likely than those whose home did not lose value to say it’s acceptable to renege on a mortgage (20% vs. 14%). 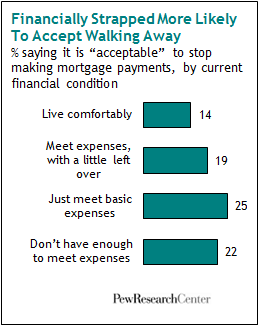 Renters are even more likely to say it’s okay to stop making house payments: Fully a quarter (25%) say it is acceptable to walk away. Those who have had financial problems during the recession are more likely than others to say that walking away from a mortgage is acceptable. But homeowners who say their homes are worth less than what they owe are not more tolerant of the practice than those who would break even or make money on a sale (18% vs.17%). While some demographic groups are more likely than others to say it’s okay to walk away — among them, Hispanics, adults younger than age 65 and those living in the West — these differences are mostly modest. For example, nearly a quarter (24%) of all Hispanics say it’s acceptable to abandon a mortgage, compared with 17% of whites and 21% of blacks. However, roughly similar majorities of Hispanics (58%), blacks (56%) and whites (61%) say it’s wrong to do so. There are sharp differences by partisanship. Democrats are about twice as likely as Republicans to say it is acceptable to walk away (23% vs. 11%). According to the survey, about one-in-five mortgage-holders (21%) are currently “under water.” Black homeowners are more likely than whites to be in this circumstance (35% vs. 18%); lower-income homeowners are more likely than upper-income homeowners to face this problem (33% for those with family incomes of less than $30,000 vs. 15% for those earning $75,000 or more). Middle-aged homeowners are more likely than either younger or older homeowners to be in this situation. Caught between big mortgages, sinking home values and the financial strains associated with periods of high unemployment, many homeowners have stopped making mortgage payments and opted to “walk away” from their loans and their homes. The practice has grown so common that the mortgage finance giant Fannie Mae, reeling from mounting losses, is now suing so-called “strategic defaulters” — those who can afford a mortgage but bail anyway. Continue reading the full report at pewsocialtrends.org. 1. The question asked of respondents did not offer “depends on the circumstances” as an option. However, interviewers were instructed to accept this answer if respondents volunteered it. The fact that so many respondents volunteered this response suggests the proportion whose opinion of walking away lies somewhere between acceptance and outright rejection would have been even larger had it been offered as a choice. The question read: “As you may know, some people decide to stop repaying their home loan and ‘walk away from their mortgage,’ letting the bank or lending institution foreclose on their homes. Do you think it is acceptable or unacceptable for people to walk away from their mortgages?